Multiplication be used in the regular way. 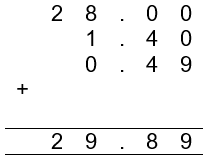 We can split the decimal up and multiply individually, adding the pieces back together at the end. 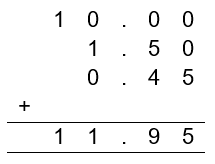 Way 1: Multiply each place value individual. Step 1: Find the value of each number. 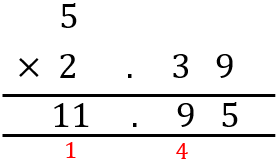 Step 2: Multiply the value represents by each number by the whole number. Step 3: Add these together. So, it doesn’t really matter which way we do this, we’ll get the same answer either way!